The pet-friendly Comfort Inn Lucky Lane hotel in Flagstaff, AZ offers cozy accommodation and a great nights rest in Northern Arizona. Located off I-40, the hotel offers easy access to attractions like Lowell Observatory, Walnut Canyon National Monument, Northern Arizona University, Arizona Snowbowl and Grand Canyon National Park. Enjoy amenities like free hot breakfast, free Wi-Fi, indoor heated pool, fitness center and business center. 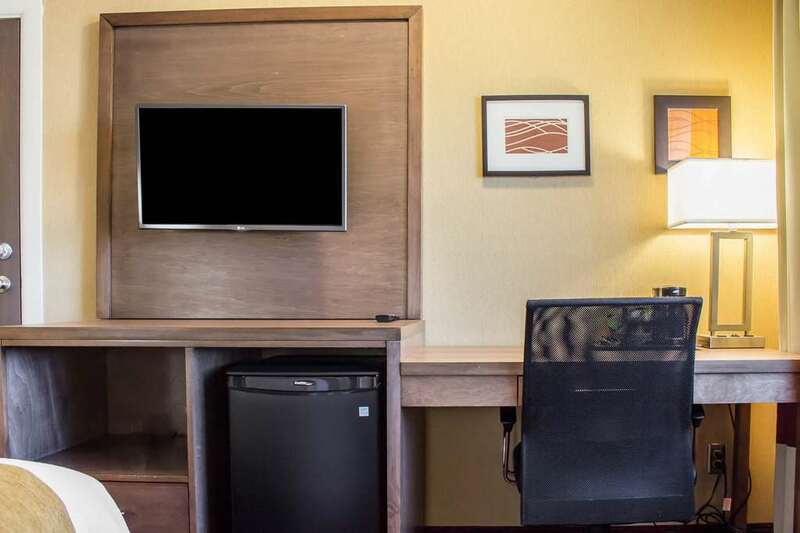 Guest rooms include mini-refrigerator, work desk, premium bedding and more. Some rooms also feature sofa beds. Also, earn rewards including free nights and gift cards with our Choice Privileges Rewards program. Pets are allowed for a fee of USD 35.00 per night, per pet. Maximum allowed weight 25 lb per pet. Pets must be housebroken and leashed. Guests are responsible for any clean-up charges. Non-declared pets will result in a USD 50.00 charge. Service animals welcome.